Bicycle Insurance protecting you and your bicycle in Spain. BICYCLE & CYCLING INSURANCE IN SPAIN. A NEW insurance policy is now available to cover you as a rider or passenger in any vehicle including bicycles, on land, air or sea, that will provide cover for death, partial or total disability and injuries sustained in any accident, medical assistance and medical cover, even as a pedestrian, anywhere in the world, even when you are on holiday. for more info Just click the banner below. Cycling in Spain is a National pastime. With bright, sunny and warm days most of the year, many people are taking to the roads to explore the beautiful countryside. Roads in Spain are not often at their best and unfortunately, accidents do happen. During the bike racing season, thousands take to the roads as part of their training, finding small country streets and Spanish mountain roads to push themselves to the limits of their endurance. Whether you want to ride around your local village, participate in competitions or just have a quiet family day out, it is wise to have the basic bicycle insurance to protect yourself and third parties that might be involved. Bicycles these days are no longer just the basic two wheeled pedal machines that we know from old. Today's bicycles can cost 1000´s of Euros to buy and range from small children´s pedal bikes with training wheels to electric bikes, very sophisticated racing bicycles, mountain bikes, and so many more all individually suited to the user. Bicycle insurance could also cover mobility scooters depending on the requirements and usage. Bicycle Insurance in Spain or seguro bici as it would be known in Spanish, will soon be available and we are preparing to provide you with this product. However it is not quite ready at the moment but please let us know by asking for a quote if you have a bike, trike, tandem or electric bike that you wish to cover, whether for personal private use or for business use. We will get back to you with updated details and provide you with additional information and what the cover entails. Or just call us on 0034 965 27 57 27, chat to us online or send us a request to CALL YOU BACK.....it`s our pleasure. In reality this information should be on the car insurance page as it is motorists that need to be aware of the laws regarding cyclists. But then again, most cyclists do own a car as well, so here it is. We, that is motorists, are all aware that we need to give cyclists a wide berth. In Spain cyclists are everywhere in small and large groups, practice for competitions and just keeping fit. There is not a month that goes by when motorists are confronted with large groups of cyclists ascending or descending hills and mountains with long tailbacks. It can be frustrating. So can being on a bicycle in Spain with tourists driving vehicles very close to you, even on the flat. The Law in Spain states that as a motorist you need to give at least a meter (approx.3 feet) or more between you and the cyclist when overtaking. Ok, so what about that big white or double white lines down the middle of the road that acts like a wall that should never be crossed? In Spain you are 'allowed' to cross this line under certain circumstances. These certain circumstances include overtaking a cyclist. This is only the case if you can see clearly ahead and there is no obstruction like other vehicles in the way and that you are not going to endanger the cyclist or yourself and you consider it safe to do so. Never overtake on a bend. When the laws were attempted to be changed in 2013 under the motoring regulations, it was proposed that all cyclists must wear a helmet in any locations including city centres. This met with so much opposition that from the 9 th May 2014, it only became obligatory for cyclists under the age of 16 to wear a helmet at all times and locations when cycling. The basic law still remains the same, Adults must wear a helmet outside of city centres, but are exempt during periods of excessive heat, on steep hills or if they are professional cyclists. The law is not specific on what constitutes a steep hill or what is considered to be 'excessive heat' and despite these regulations, it is common to see cyclists without a helmet. Use your common sense, wear a helmet at all times and in all locations. Make sure that you have adequate insurance to cover you in the event of an accident, if you require medical treatment or cause injury to others. Bicycle insurance is cheap and Spanish roads are dangerous. 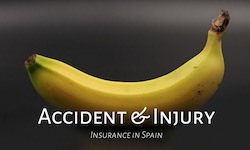 A personal accident and injury policy, which gives you fantastic cover for cycling or any other injury at home, in the garden, at work etc, is less than 100€ a year and well worth having. If you don't have private medical insurance in Spain, you can expect large bills for treatment. Be safe, be happy. Cyclists are classified on the same lines as motorists and are only permitted the same level of alcohol as a motorist, so don't believe you can cycle into town and drink and then be safe cycling home. Care and attention should be taken as it is obligatory for cyclists to wear reflective clothing so that they can be seen clearly by motorists. It is not permitted to cycle more than two abreast when in groups as it is considered dangerous, you can and will be prosecuted. Call us on 965 27 57 27 and we will make sure you are protected.